The first of (maybe) several live-blog posts today on the Millennial Donor Summit! 1. 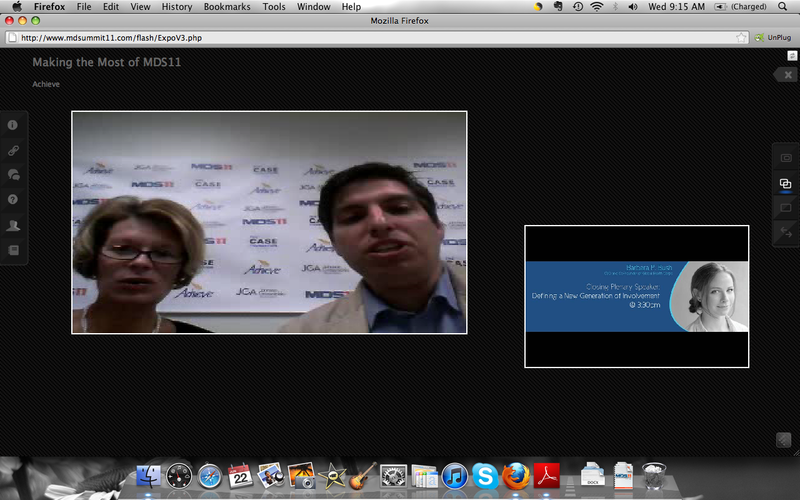 The virtual conference system is amazing. Sharp graphics, easy navigation, speedy system. I thought it might be tough. It’s like literally walking into a convention hall. Kudos to Expos2 – the company running it. 2. Help is there for you. The hall opened at 8am. By 8:15 I had two technical issues with video and my booth. By 8:20 both were resolved. 3. They’ve engaged thought leaders like no one has before. The opening introductory session ran through the list of rockstars on today’s agenda. Can’t wait. 6. Enter a booth and you can watch videos, download brochures, chat with the whole room, video chat with individuals and more. No hokey sales folks. No schemey (sp?) pitches. Just good wholesome learning. 7. I’ve meet a dozen new friends already. 8. I’m 3 feet from the fridge, 10 feet from the bathroom and inches from my screen – engaged in brilliant professional development in complete and utter comfort. 9. For $75 it’s the best fundraising education opportunity this year by FAR. 10. Heidi from Livestrong is starting now! 11. Watching certain nonprofit bloggers do a Buddy the Elf impression. Solid.